Finally! I'm able to post this photo of No.18 RAF Glider Pilots 'A' Flight and namely Sgt. Norman Beasley (indicated in photo). I was contacted by Sgt. Beasley's son-in-law, Melvyn Cox several weeks ago. "My father in law, Sgt Norman Beasley was attached to the Glider Pilot Regiment from late 1944 to mid 1945. He gained his wings in Carberry, Canada in August 1944 and the Glider Pilots was his first operational posting. On his return from Canada he was sent for further training at RAF Bridgnorth then Harrogate awaiting posting to HGCU for glider pilot training. In January 1941 He was transferred to ORTU at RAF Hampstead Norris and finally to 2 Wing GPR we believe at RAF Mushroom Farm in Essex where he was held in reserve for Operation Varsity. Details of the next few months are a little sketchy but we believe he was later based at RAF Hengistbury Head and eventually transferred out of the GPR in August 1945. His records later show some abbreviations which we are unable to decipher: ORTU and EGPR at Mushroom Farm; E of GPR and E of GR at Hengistbury Head – do you know what these stand for? I attach a copy of a photograph of No 18 Glider Pilots as you asked for pictures of RAF units in Battledress – I hope that this is of some help. Sgt Norman Beasley is 3rd from right on the front row. Do you have any more information about the training that was undertaken or have any idea of where the photograph was taken?" 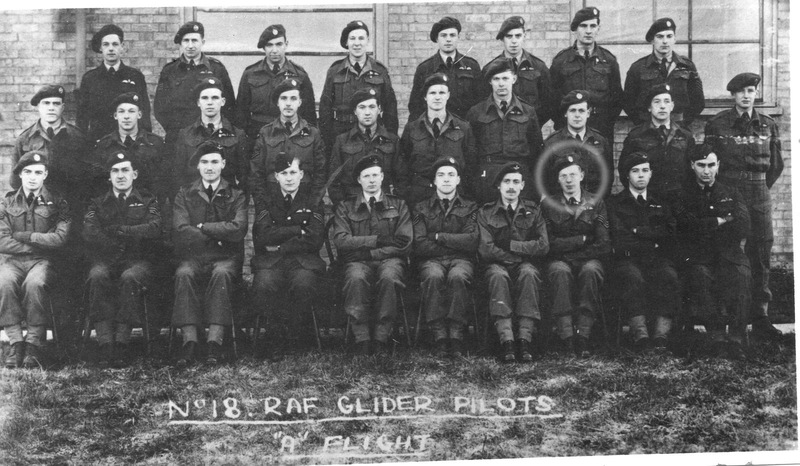 After a bit of research I advised Melvyn that ORTU stands for Operational and Refresher Training Unit (if any readers know otherwise please do let us know) and that, in my opinion, EGPR/E of GPR and E of GR would probably indicate 'E' Squadron of Glider Pilot Regiment (again, if any of you know differently please let us know).